A swath of the country from the Texas panhandle to Oklahoma, Kansas and parts of Missouri were battered with another round of freezing rain Sunday as a winter storm — which has already coated roads in ice and contributed to accidents that killed six people — churned through the Midwest and Plains. Three people died in three crashes in Missouri thought to be weather-related Friday and Saturday, the state highway patrol said. In Oklahoma, a truck driver was killed in a crash on an ice-covered highway just before a 3:30 a.m. Saturday. The stretch of road was the scene of nearly a dozen other crashes, the state highway patrol said. In Kansas, two people were killed in separate car crashes on Saturday night. In both incidents, the vehicles slid on ice-covered roads and into ditches, where they rolled. Over 20 vehicles were involved in a pileup near downtown Wichita, Kansas, Saturday. Two people suffered minor injuries, authorities said. Parts of Iowa could see ice Sunday afternoon into Monday, forecasters said. Widespread freezing rain was expected to continue over much of Oklahoma, Kansas, and Missouri through Sunday, as a result of a winter storm, according to a National Weather Service report issued at 2:55 a.m. ET. There are expansive ice storm warnings, freezing rain advisories and winter weather advisories in effect from northeast New Mexico to central Illinois. Forecasters expect a quarter to half an inch of ice will be common in the affected area Sunday — with half-an-inch to an inch possible, especially from southeast Nebraska to northwest Oklahoma. This was expected to result in downed trees, power lines and power outages in the affected areas. By Sunday morning, as much as an inch of ice had reportedly already accumulated in Beaver, Oklahoma, while Woodward, Oklahoma, and Dodge City, Kansas, saw up to half an inch of ice, according to the Weather Channel. Power outages were affecting just over 19,000 people in Missouri, almost 11,000 customers in Oklahoma and just over 600 in Kansas Sunday morning. More than 2,800 flights are expected to be delayed today and over 200 are expected to be cancelled, according to the Weather Channel. Airports in the affected region appeared to be operating largely normally early Sunday. The Kansas National Guard was mobilized Friday to assist stranded motorists and provide emergency transportation. Oklahoma's governor declared a state of emergency for the entire state ahead of the storm. Ice storm warnings were in place from northwestern Oklahoma, through Kansas and into much of Missouri and in northeastern Nebraska and southwestern Iowa Saturday night. Parts of southern Kansas got a quarter-inch of ice. St. Louis forecasters said a last bout of freezing rain could come overnight, but the weather could persist in Nebraska and Iowa through Monday. The Omaha area could get between a quarter-inch to a half-inch of ice by Monday, the National Weather Service said. "I would recommend that if you don't need to go anywhere or if it's not an emergency to just stay at home," Iowa State Patrol Trooper Jeff Huffman said of the icy weather expected to hit the state Sunday and Monday. Reports have said residents of the affected areas appear to be taking the warnings seriously, with grocery stores selling out of basic necessities like bread and milk, and hardware stores selling out of generators. In some parts of Missouri, the ice wasn't as bad as feared. Missouri electricity company Ameren said Saturday afternoon that only around 1,400 people were without power, down from around 30,000 earlier in the storm. "There's only been a few places where we found that half inch of ice that was predicted," Kevin Anders, assistant vice president of operations and technical services for Ameren. But the threat of icy weather caused Sunday's NFL playoff game in Kansas City between the Chiefs and the Steelers to be postponed from 1:05 p.m. ET to 8:20 p.m. ET in order to give road crews a chance to clear streets. The storm was expected to move northeast, but there was some good news: A freezing rain advisory for central Indiana which had been in place until 1 p.m. was canceled Saturday night. Kansas City dodged the ice storm that prompted the NFL to push back the start of the Steelers-Chiefs playoff game and the league announced it will proceed with kickoff Sunday night. The NFL decided Friday to move the start of Sunday's divisional game from 1 p.m. to 8:20 p.m.ET. The original forecast called for icy conditions until Sunday afternoon, and authorities had urged people to stay off the roads. But while other parts of the Great Plains were frozen over, Kansas City was largely spared. While ice accumulated on cars, homes and lawns, roads were mostly wet with the occasional slick spot. Kansas City's main airport was open, though the Kansas City Star said more than 50 flights had been canceled. Some seats at Arrowhead were coated with ice, but crews were up early to get the stadium ready. With more rain in the forecast and temperatures not expected to climb much above 30 until the afternoon, the National Weather Service was warning of the potential for slick conditions. The forecast for Sunday night in Kansas City calls for rain throughout the game, but the temperatures are expected to stay just above the freezing mark. The icy weather will linger a bit longer. The major winter storm affecting parts of the central US and upper Midwest will continue through Monday, according to the National Weather Service. Significant freezing rain will continue for portions of the Plains and Midwest on Sunday as additional weather systems approach from the west, the National Weather Service said. Cold air will bring snow to the High Plains. On the southern side of the storm, warmer air may allow severe thunderstorms and heavy rain to develop in Texas on Sunday. The storm will push north and then east and impact cities like Chicago, Green Bay, and Detroit on Monday. It will then head to Rochester, New York, and Springfield, Massachusetts, on Tuesday into Wednesday, said CNN meteorologist Allison Chinchar. Flooding is expected to return to Northern California by midweek. The Pacific Northwest looks to receive over 10 inches of rain through next Sunday. More than 30 million Americans are under some type of wintry watch, warning or advisory from the storm in the Midwest, and 10 million of those fall under an ice storm warning. 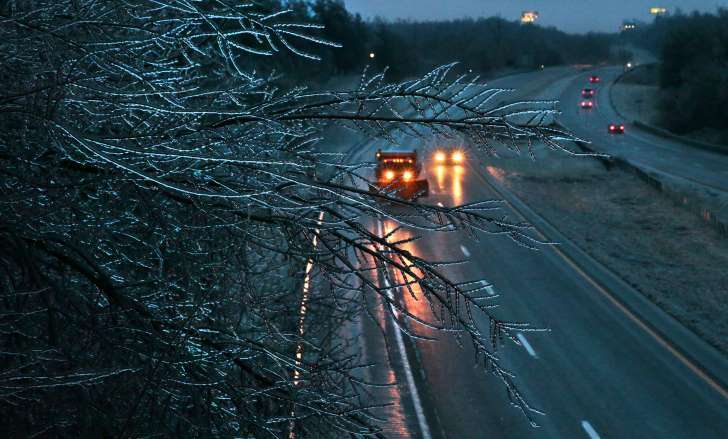 The hardest-hit states of Oklahoma, Kansas and Missouri will continue to see up to one inch of ice coating trees and roads, making travel tricky and potentially bringing power outages to millions of residents. Oklahoma Governor Mary Fallin declared a state of emergency for all 77 Oklahoma counties on Thursday. In Kansas and Missouri, nearly 200 National Guard soldiers geared up to provide emergency response assistance to local authorities. In Missouri, three people have died on highways due to the inclement weather conditions, Missouri Dept. of Public Safety spokesman Mike O'Connell told CNN. A multi-vehicle crash led to one motorist being ejected and struck by an unidentified vehicle going southbound on Interstate 29 Saturday in Platte County, the Missouri State Highway Patrol said. Also on Saturday, another vehicle overturned on an ice covered roadway in Nodaway County and the driver was ejected. An on Friday a motorist died after she lost control of her vehicle on an icy overpass on Interstate 55 in southeastern Missouri. The icy conditions caused another weather-related death in Custer County, Oklahoma. A motorist died during a traffic collision in the western part of the state, which resulted in a multi-vehicle pile up on Interstate 40, the Oklahoma Highway Patrol said. The NFL even rescheduled a playoff game because of the ice storm. The Kansas City Chiefs will now host the Pittsburgh Steelers at 8:20 pm ET on Sunday instead of 1:05 p.m. ET, due to "public safety concerns in light of the forecasted storm," the league said. Kansas City will see significant icing through the morning on Sunday, changing over to rain early in the afternoon. Moving the game back seven hours was expected to reduce the danger of icy roads for those traveling to the game. Due to expected power outages and limitations on travel, the Kansas Department of Emergency Management warned citizens to "make sure their home emergency kits are stocked for a 3-day supply." 0 Response to "6 Dead in Winter Storms as Kansas and Missouri Brace for More Ice"